U.S. Naval Hospital. Corpsmen in cap and gown ready to attend patients, Mare Island, California 12/10/1918. Image courtesy of Navy Medicine via Flickr Creative Commons. Online ticket sales for this program have now closed, but you can purchase a ticket in person at the Museum when you arrive, see you tonight! This year marks the 100th anniversary of the deadliest disease outbreak in human history: the global influenza pandemic of 1918. The pandemic is estimated to have infected a quarter of the world’s population and surpassed all of the military deaths in World War I and World War II combined. A century later, it’s hardly an illness of the past. In fact, the Centers for Disease Control and Prevention estimates that there are tens of thousands of flu deaths in the United States annually. While we have a better understanding now of viruses, diagnostics, and treatments than in 1918, our globalized society is more interconnected than ever before, spreading our cultures – and our germs – worldwide. 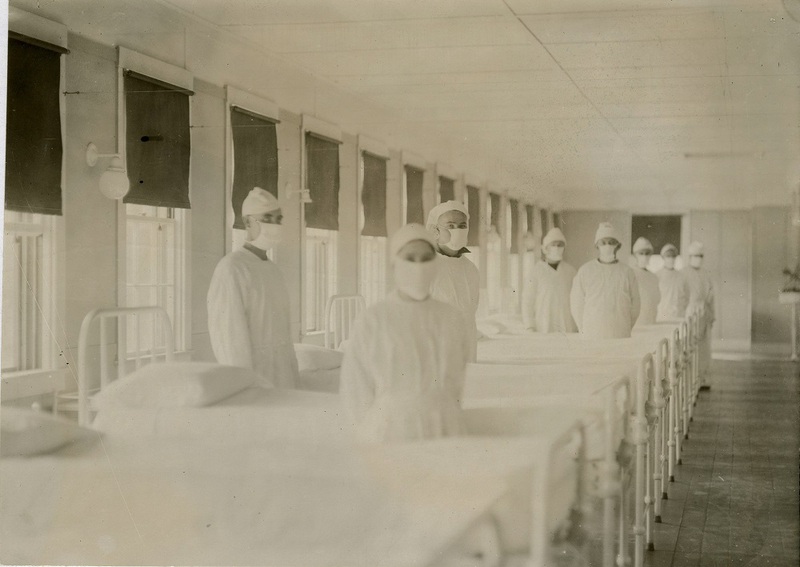 Join Nicole Bouvier, MD, an infectious disease specialist, and John Barry, author of The Great Influenza: The Story of the Deadliest Pandemic in History, to discuss the lasting impact of the 1918 pandemic and its connections to the present day with historian of science Alan Kraut, PhD. This program accompanies our exhibition Germ City: Microbes and the Metropolis (on view through April 28, 2019). To view all of the programs in this series, click here. To promote epidemic preparedness, Walgreens | Duane Reade has generously partnered with the New York Academy of Medicine and the Museum of the City of New York to offer a pop-up flu shot clinic prior to this panel discussion. Event registrants are welcome to come early with their insurance card to receive a flu shot from 5:00 pm to 6:30 pm. There may be a limited number of no-cost flu shot vouchers available for this event for people who are uninsured or underinsured. Visit the Museum before the program - admission is included with your ticket. John Barry is a New York Times best-selling author. The National Academies of Science named his 2004 book, The Great Influenza: The Story of the Deadliest Pandemic in History, the year’s outstanding book on science or medicine. Currently, he is a Distinguished Scholar at Tulane's Bywater Institute and an adjunct faculty member at the Tulane School of Public Health and Tropical Medicine. Nicole Bouvier, MD is an infectious disease specialist whose research focuses on the influenza virus. She received her Doctor of Medicine from the Icahn School of Medicine at Mount Sinai in 2004 and completed her internship and residency training in Internal Medicine at the Mount Sinai Hospital from 2004 to 2007. In addition to research, Bouvier is also a practicing physician and serves as a teaching attending on the General Infectious Diseases consult service at the Mount Sinai Hospital. Alan M. Kraut, PhD (moderator) is professor of history at American University, affiliate faculty in the School of International Service, and a non-resident fellow of the Migration Policy Institute. He specializes in U.S. immigration and ethnic history as well as the history of medicine and is the author of several books including Silent Travelers: Germs, Genes, and the "Immigrant Menace." Previously, Kraut served as president of the Organization of American Historians, the largest professional organization of American historians. Includes admission to the Museum of the City of New York.